First the promised pictures from the last entry. This is the evening near Woljeong sa. A morning walk here can really make your day! But also some weird signs in the park. 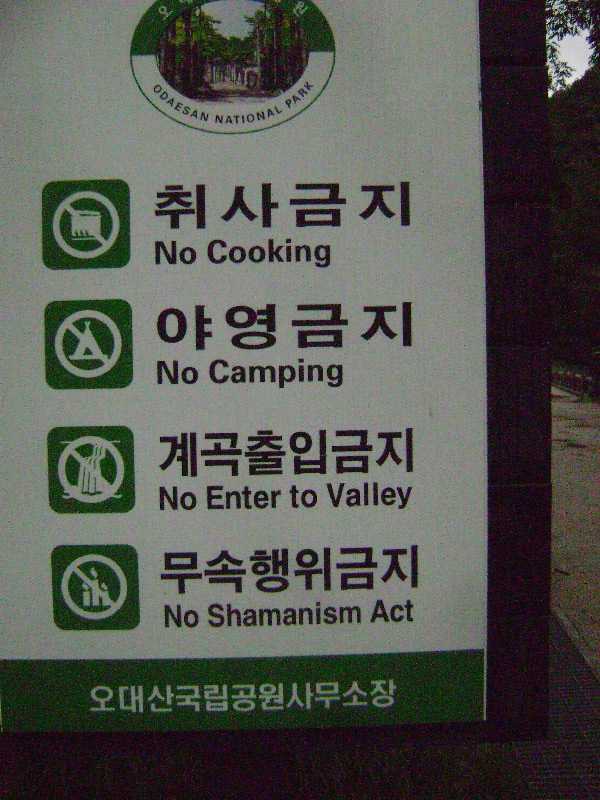 protected area, you know... No what??? From Sangwon sa I reached Birobong to have an amazing view of... nothing. The top was in the clouds, it was raining and it was cold so I just gave up on following the Odaesan crest to reach it's highest peak, some 3 meters more than Birobong, and went back in the valley the way I came up. Since on the way to Birobong there are two more temples the path was pretty crowded even in a rainy day. My next destination was Dongdae san and that was a tough one. Had to do 1000 meters in altitude on a 2.7 km long way. Had to have three breaks, I'm getting too old for fun like that. Not for the mountains, it's just my philisophy "omnia mea mecum porto" and I end carrying a 20+ kg backpack with me. From the top of Dongdaesan I had the same pretty view as from Birobong, with the addition of a really hard rain. And then I was really soaked wet. Anyway I had to laugh when I finally recognized some Korean mushrooms. Now I know I can do mushroom picking also here! Yes, it's definitelyy him - Boletus! But I won't do it for economical purposes, in a country where fruits and vegetables are outrageously expensive, 1kg of dried boletus is about 5 euro! I had no choice, I had to follow the sign showing me to the left - sort of "nothing there"? I descended in the next valley, actually it's a pass, having in mind to find a place to sleep and continue in the valley of waterfalls. Descendig - the stairs! 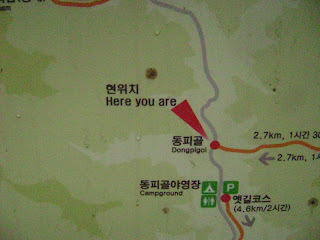 According to the map on the Jingogae pass there is a rest area, the Park entrance and so on, so I was expecting it would be easy to find any kind of place for the night. But it was a real disappointment - a huge parking lot, a small restaurant and a closed ranger station. A roof so small that I barely managed to have a smoke without wetting the cigarette. And yes, a so stinky toilet that I opted for taking a crap under the rain. The nearest shelter is on the Noinbong peak, some 2 hours walk. I couldn't do it. It was getting dark, I was too tired and there was again a very good chance of the shelter being closed, abandoned or who knows what. 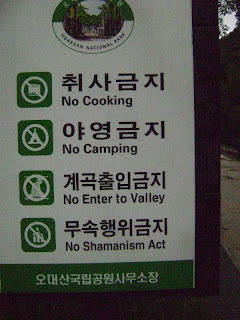 No way, back to the valley. I gave up. I had only one barely dry shirt, no chance for making a fire for cooking and it was dark already. But I slept nice and dry and woke up at 9 AM, the clothes were almost dry, the river nearby was clear, so in the end it was a pleasant defeat. Even more pleasant because after just a three hours walk I was knocking on the door of an apartement, shouting "It's uncle Dag!" and a shiny smile welcomed me. If only all the defeats would be like this!